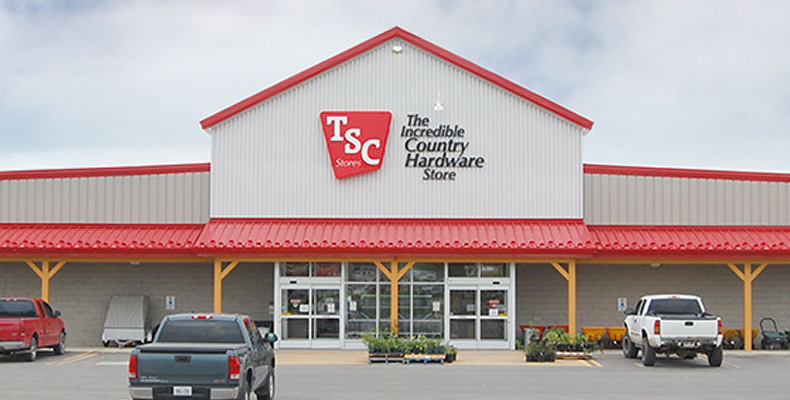 Welcome to the TSC Stores website! This is the official website of TSC Stores L.P (“TSC”). Please carefully review the Terms & Conditions (the “Terms”) below which govern the use of this site. Note that your use of www.tscstores.com (the ‘Site’) constitutes your unconditional agreement to be bound by these terms and conditions. This Site may contain certain proprietary notices and intellectual property information, the terms of which must be observed. Information on the Site may contain technical inaccuracies or typographical errors. Information, including store-based pricing, advertising and marketing materials, product pricing and availability, may be changed or updated at TSC’s sole discretion without notice and without any obligation, legal or otherwise, to sell at that price..
All information you submit to us shall be true, accurate and complete. No information or material provided to TSC by you, or an agent working on your behalf, may (i) contain vulgar, obscene, threatening, or otherwise unlawful language or material; (ii) reasonably under the circumstances might be deemed threatening, abusive, harassing, tortuous, vulgar, hateful, or racially, ethnically, or otherwise offensive or discriminatory; (iii) be tortuous, defamatory, libelous, invasive of another person’s privacy, or violate another person’s publicity rights; (iv) bear any false, disguised, or misleading origin; or (v) be confidential and you do not have a right to disclose. By sending content, information or material, you grant TSC an unrestricted, irrevocable license to use, reproduce, display, perform, modify, transmit, and/or distribute materials or information, and you represent and warrant that you own or otherwise control all of the rights to such information or materials and that TSC is free to use ideas, concepts, know-how or techniques that you send us without any compensation or acknowledgment. Not to interfere with TSC or another authorized party's use and enjoyment of the Site. This Site may contain links to other websites to help customers learn more about the products available at TSC. TSC is providing these links to you only as a convenience, and the inclusion of any link does not imply endorsement by TSC of the subject website or any association with its operators. TSC does not have control over, and is in no manner responsible or liable for, the availability, accuracy and content of the websites to which this Site is linked or any damages, loss of data or any other liability arising from the websites with respect to freedom from errors, viruses, bugs, or other harmful components.. TSC makes no representations whatsoever about any other site you may access through this Site. Any concerns regarding any product or service offered by a website to which this Site is linked or the link itself should be directed to the operator of that specific website and not to TSC. TSC has no obligation to monitor use of the Site or retain the content of any of the sessions on the Site. However, TSC reserves the right at all times to monitor, review, retain and/or disclose any information necessary to satisfy any applicable law, regulation, legal process, governmental request or the business needs of TSC. TSC is the sole and exclusive owner of all intellectual property rights in and to all aspects of the Site including, without limitation, any related patents, copyrights, trade secrets, trade names, trademarks, service marks, goodwill, moral rights, and any other intellectual property or proprietary rights or intangible assets recognized under any laws or international conventions. TSC may modify, disable, or delete the Site, its functions and/or Site content at any time and for any reason without prior notice. TSC grants you a limited license to use the materials made available on the Site only for your personal use. The materials on the Site shall not be used for any commercial purposes whatsoever. You acknowledge that any copies or derivative works created from the materials on the Site shall be the sole and exclusive property of TSC. TSC, in its sole discretion, may revoke this license at any time without prior notice to you and without liability. You may only download content displayed on the Site for non-commercial, personal use provided you also retain all copyright, trademark and other proprietary notices, symbols and/or indicating marks contained in the material, do not modify or alter the material and do not copy or post the material on any network computer or broadcast the material in any media. TSC may, in its sole discretion, terminate your account or your use of the Site at any time without liability. You are personally liable for any orders that you place or charges that you incur prior to termination. You assume all responsibility and risk for the use of this Site and the Internet generally. This Site is provided by TSC on an "AS IS" basis. TSC makes no representations or warranties of any kind, express or implied, as to the operation of this Site or the information, content, materials, or products included on this Site, to the fullest extent permissible by applicable law. TSC disclaims all warranties, express or implied, including, but not limited to, implied warranties of merchantability and fitness for a particular purpose, non-infringement of intellectual property rights or other proprietary rights, and freedom from errors, viruses, bugs, or other harmful components. TSC will not be liable for any damages of any kind arising from the use of this Site, including, but not limited to direct, indirect, special, incidental, punitive, consequential damages or damages resulting from loss of use, data, or profits, or business interruption arising out of or in any way connected with the use of the Site, and delays on the Site, or the inability to use the Site, any portion thereof, or any hyperlinked website, whether based on contract, tort, negligence, strict liability or otherwise, even if TSC has been advised of the possibility of such damages. IN NO EVENT SHALL TSC OR ANY OF ITS RESPECTIVE DIRECTORS, OFFICERS, EMPLOYEES OR AGENTS BE LIABLE TO YOU FOR ANY DIRECT, INDIRECT, SPECIAL, INCIDENTAL, CONSEQUENTIAL, INDEMNITY, EXEMPLARY OR PUNITIVE DAMAGES, LOSSES OR CAUSES OF ACTION (WHETHER IN CONTRACT OR TORT, INCLUDING, BUT NOT LIMITED TO, NEGLIGENCE OR OTHERWISE) ARISING FROM OR IN ANY WAY RELATED TO THE ITEMS SOLD THROUGH THE SITE, INCLUDING, WITHOUT LIMITATION, LOSS OF REVENUE, OR ANTICIPATED PROFITS, OR LOST BUSINESS, SALES OR ANY OTHER TYPE OF DAMAGE, TANGIBLE OR INTANGIBLE IN NATURE, EVEN IF TSC OR ITS RESPECTIVE REPRESENTATIVES OR SUCH INDIVIDUALS HAVE BEEN ADVISED OF THE POSSIBILITY OF SUCH DAMAGES. BECAUSE SOME PROVINCES DO NOT ALLOW THE EXCLUSION OR LIMITATION OF LIABILITY FOR CONSEQUENTIAL OR INCIDENTAL DAMAGES, IN SUCH PROVINCES LIABILITY IS LIMITED TO THE FULLEST EXTENT PERMITTED BY LAW. ALL TRIALS BY JURY AND ANY LIABILITY OF TSC FOR INCIDENTAL, CONSEQUENTIAL, EXEMPLARY, OR PUNITIVE DAMAGES ARE WAIVED. You shall indemnify, defend and hold TSC and its officers, directors, employees, shareholders, members or agents harmless from all damages, liabilities and expenses (and all legal costs including attorneys' fees, court costs, expenses and settlements resulting from any action or claim) arising out of, connected with or resulting from any violation of these Terms by you or your use of the Site or information provided by you to the Site. Cookies are small files which are stored on your computer. They are designed to hold a modest amount of data which may be stored on your hard drive so that we can recognize you when you return. Any pages on our Site where you are prompted to log in or that are customizable require that you accept cookies. If you have registered with our Site, these cookies may let us know who you are; are necessary to access your account information (stored on our computers) in order to deliver products and personalized services; and will provide us and our service providers with information that we will use to personalize our site in accordance with your preferences. Cookies are also required to optimize your shopping experience in that they allow you to add multiple items to your shopping basket before checking out. You may set your Web browser to notify you when you receive a cookie. However, should you decide not to accept cookies from our Site, you will limit the functionality. Prices, promotions, and availability may vary by store and online. Although we strive for accuracy, some errors may occur. TSC reserves the right to correct any errors. This includes regular & sale pricing posted in error. TSC Stores reserves the right to cancel any orders with errors in pricing. This also includes errors related to promo discount codes. Customers cannot stack discounts- one promo code per order is allowed. TSC Stores reserves the right to cancel any orders with multiple promo discount codes, resulting in double discounting. Because item quantities are constantly changing, the inventory information provided is an approximate indication of an item's in stock position. Inventory cannot be guaranteed. This includes Factory Ordered items, which are stocked at the vendor. Orders: receiving an email confirmation does not guarantee the acceptance of an order by TSC. TSC, at its own discretion, may limit or cancel rders. In the event we make a change to an order, we will attempt to notify the customer by phone or email with the information provided at time of order. Products & Pricing : TSC reserves the right to discontinue the sale of any product listed on this site at any time without notice. Although we strive for accuracy, some errors may occur. TSC reserves the right to correct any errors including pricing, pictures, and copy. Payment & Promo Codes: all orders must be paid in full when an order is placed online. Payment can be made via Mastercard, VISA, or American Express. Promo codes are required during time of online check out, and are valid for a specified period of time before expiring. Shipping: TSC will use their best efforts to ship online orders as per the timing specified for the product. In some instances, exceptions may occur due to circumstances beyond TSC’s control. TSC will attempt to notify the customer when orders may be delayed. If a product becomes unavailable, the customer will be contacted to discuss the circumstances. The customer agrees that TSC may rescind their acceptance of the online order, and cancel the order without penalty in select circumstances. Restocking fee: TSC Stores reserves the right to charge up to a 10% restocking fee for an Online Order Ship to Store product(s) that are unclaimed after 20 days of the order date. This restocking fee will be applied to the credit card used for order validation during the checkout process.